See Homecoming 2018 photos from TD and K Photography (downloads are free). Congratulations to the Chenango Valley boys varsity swim team for being ranked #5 in New York State for Class B! Way to go, Warriors! 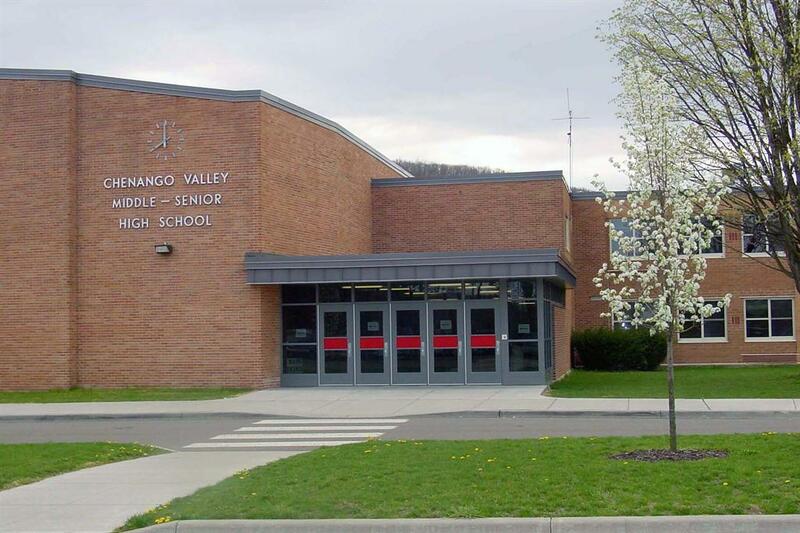 Chenango Valley High School held its Spring 2019 Pep Rally on April 12. The event included fun activities such as a dance-off and even a special lip sync presentation by high school teachers and Principal Ostrander! See photo gallery. Students in Mrs. Chavez’s child psychology class recently took a field trip to the Discovery Center. See more. The Chenango Valley Saxophone Ensemble recently participated in a Music in Our Schools Month performance at the Oakdale Mall. See more. The CVHS Theatre Guild put on a fantastic production of "The Addams Family" this March! See some photos of the cast and crew. Four Chenango Valley High School students participated in the Chemistry Olympiad local exam at Binghamton University on March 8. See more. Students in Mrs. Chavez’s culture and foods class recently spent time studying the Mid-Atlantic region of the United States. During their studies, they tried scrapple, a Pennsylvania Dutch tradition. See more. Two Chenango Valley High School students recently had their artwork featured in the 2019 New York State Art Teachers Association (NYSATA) Legislative Student Art Exhibit. See more. The Chenango Valley Athletics Department hosted an Athletic Summit on March 12. See more. Chenango Valley High School ninth grade students recently learned more about the opportunities available through the Broome-Tioga BOCES Center for Career and Technical Excellence. See more. Congratulations to our winter New York State Public High School Athletic Association (NYSPHSAA) scholar-athlete teams! See more. Congratulations to the Chenango Valley Varsity Volleyball Team for receiving the 2018 STAC League Sportsmanship Award! Way to go, Warriors! See more. CV High School student-athletes had the chance to take part in a Student-Athlete Leadership Conference called “Positive Leadership is Powerful Leadership” on March 1. See more. Thank you to New York State Senator Fred Akshar for visiting Chenango Valley High School and discussing ways to lessen the number of teens and young people vaping with our YES LEADers. See more. Congratulations to Chenango Valley High School seniors William Blewett, Morgan Jones and Joshua VanBarriger who were Broome-Tioga BOCES winners in the 2019 SkillsUSA Regional Conference at SUNY Morrisville on February 8. See more. Congratulations to the Chenango Valley High School Varsity Cheer team for qualifying to compete in the 2019 New York State Public High School Athletic Association (NYSPHSAA) Cheerleading Championships at the Rochester Institute of Technology - Gordon Field House on March 2. The team was also Sectional Champions! Way to go, Warriors! Congratulations to Michael Godbay and Mallorie Turner who both qualified to compete in the 2019 NYSPHSAA Indoor Track & Field Championships on Staten Island on March 2. Michael qualified in the long jump and 55m and Mallorie qualified in the triple jump. Way to go, Warriors! Advanced art students in Mr. Fitzsimmons' and Mr. Wilson's classes had a wonderful time visiting the Corning Museum of Glass on February 23. See more. Chenango Valley placed eighth out of 25 teams in Section IV. Congratulations to CV High School wrestlers Brady Hope and Nathan Lehr who have qualified to participate in the 2019 New York State Public High School Athletic Association (NYSPHSAA) Wrestling Championships! See more. The Chenango Valley High School varsity cheer team did an awesome job and made it all the way to the semi-finals round, and placed 16th in their division, at the 2019 UCA National High School Cheerleading Championship in Orlando, Florida! Way to go, Warriors! On February 9, the Chenango Valley Science Olympiad team competed against 17 other districts in the regional tournament held at Maine-Endwell Middle School. See more. The deadline for ordering and being guaranteed a 2019 copy of the Chenango Valley High School Yearbook is March 29. See additional important information. Kenna Abell, a Chenango Valley High School sophomore, was recently selected as an “Artist of the Week” for her Prismacolor dog portrait project through the high school’s online gallery on Artsonia.com. See more. Chenango Valley High School student athletes had the chance to meet Joan Benoit Samuelson at the 14th Annual Celebrating Women's Athletics Luncheon at Binghamton University on February 4. See more. Congratulations to the Chenango Valley Junior Varsity Girls Bowling team - STAC East Division Champions! Congratulations to Aidan Marroquin who was selected to the United Soccer Coaches All-New York team for the 2018 season! Congratulations to the Chenango Valley Varsity Cheer team - Grand Champions at the Union-Endicott Invitational on February 2! Awesome job to the Chenango Valley High School STEAM Club members who participated in the Vex Competition in Elmira! See more. Chenango Valley High School student artwork shined in the 2019 Regional Scholastic Art Awards competition. See more. 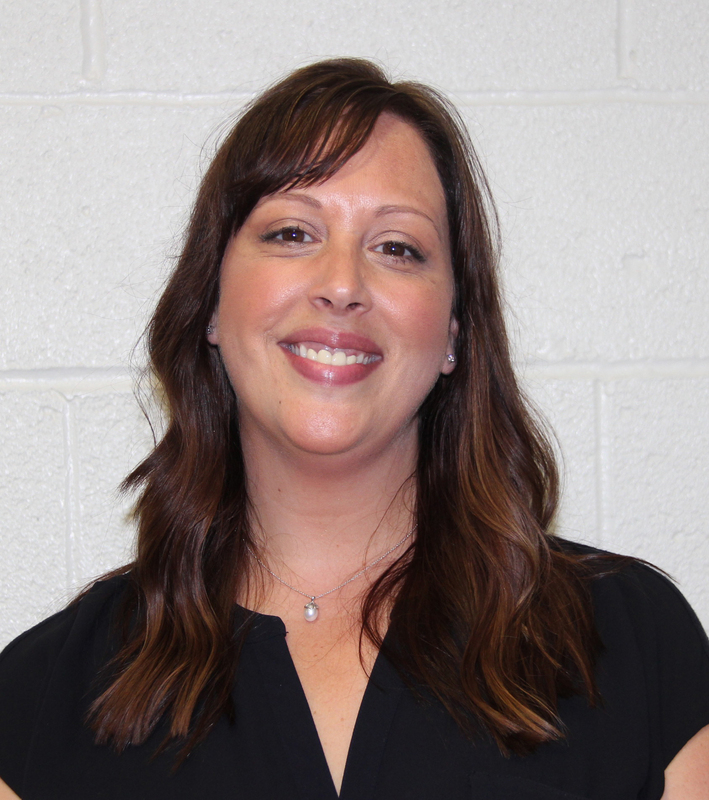 The January 30 "Coffee and Conversation with Chenango Valley High School Principal Jennifer Ostrander" event has been postponed. A new date/time will be forthcoming. See more. Five athletes from the Chenango Valley varsity boys swim team are going to States! The boys swim team was also named STAC East Division Champions! See more. Congratulations and best of luck to Chenango Valley High School junior Katerina Retzlaff who was selected to take part in the United States Senate Page Program. See more. Congratulations to the Chenango Valley Junior Varsity Cheer team for placing first in the JV Division at the fifth annual Sweetheart Classic on January 26! See more. Congratulations to Colsten Volpe - STAC Wrestling Champion! Chenango Valley High School students were asked to complete the phrase “I AM…” as part of a Warrior STRONG project. See more. On January 18, Chenango Valley High School Health students went on a field trip to CoreLife Eatery in Vestal. See more. Mrs. Ginalski’s Fast Forward Chemistry students recently researched the best ways to break down biodegradable plastics. On January 17, they presented their findings in a gallery walk. See more. The Chenango Valley High School Pep Band had a wonderful time performing at a Binghamton Devils hockey game on January 4. See more. Congratulations to the Chenango Valley girls varsity swim team, as they finished their season ranked fourth in the state in Class B. Way to go, Warriors! Congratulations to both Chenango Valley boys basketball teams for winning in the 2018 Greene Holiday Tournament! See more. On December 15, members of the CVHS Business Club were among those who helped to place wreaths on the graves of U.S. veterans laid to rest in the Chenango Valley Cemetery as part of National Wreaths Across America Day. See more. Congratulations to CV High School Class of 2019 senior Mallorie Turner who signed a National Letter of Intent to accept a Track & Field scholarship with Binghamton University! See more. Chenango Valley alum Alexia Lamb visited Mrs. Ginalski and Mr. Reed’s College Chemistry and Biology students on December 21 to moderate a discussion and simulation on climate change. See more. Chenango Valley High School put on a wonderful winter holiday concert on December 18, including a tribute to our nation's veterans and active duty personnel. See photos. Chenango Valley High School junior Erin McCollough accepted a first place award in the “Country Style, the Rural Architecture of Broome and Tioga County” juried digital photography exhibition. See more. The Chenango Valley Varsity Cheer team has qualified to participate in the 2019 UCA National High School Cheerleading Championship in Orlando, Florida this coming February! Congrats Warriors! New York State Senator Fred Akshar visited Dr. Hemzik’s Participation in Government class at Chenango Valley High School on December 5. See more. YES LEADers at Chenango Valley High School learned about the importance of being a positive role model as they took part in a YES LAUNCH training on December 5. See more. Congratulations to Chenango Valley High School Class of 2019 senior Nathan Lehr who signed a Letter of Intent to accept a lacrosse scholarship with Limestone College! See more. Chenango Valley High School health classes received a special visit from Binghamton Police Officer Kevin Brown and Lilo the K-9 on December 11. See more. On December 6, students in Mrs. Chavez’s Gourmet Foods class took on a “Grilled Cheese Challenge” for some fun, friendly and delicious competition. See more. As Chenango Valley High School band students prepare to perform an Armed Forces Salute to honor veterans and active duty personnel at their upcoming winter concert, a CV parent and former Marine visited the school to speak about his experiences while serving. See more. Students in Mrs. Chavez’s culture and food classes created beautiful dessert designs as part of a pie decorating challenge. See more. On November 29 and 30, Mr. Tidick’s Enriched 9 students gave presentations on famous landmarks and people in world history. See more. Five athletes from the Chenango Valley varsity girls swim team were recognized for their participation in the 2018 NYSPHSAA (New York State Public High School Athletic Association) Girls Swimming & Diving Championships during the November 28 CV Board of Education meeting. See more. Chenango Valley has been participating in the Scholastic Art Awards for over 12 years and looks forward to displaying the hard work and talent of our art students. See more. Mrs. Chavez’s Gourmet Foods class received a special visit regarding nutritious diets. See more. Mr. Wilson’s painting and drawing students have been working on reductive charcoal skill building to help expand their artistic talents. See more. Tiny chairs, orange lunch trays, and delightful little learners -- a Fast Forward class from CV High School was welcomed to Charles F. Johnson Elementary School on November 13. See more. As a way to give thanks, students in Mrs. Chavez’s Gourmet Foods class treated some of our Chenango Valley staff to a delicious “Harvest Delight” meal on November 15. See more. Chenango Valley High School student work was recently displayed at the New York State Art Teacher's Association conference in Buffalo, New York. See more. Congratulations to Olivia Bochenek, who New York State Senator Fred Akshar recognized as an “Akshar All-Star” recipient on October 23. See more. Three Chenango Valley High School students recently participated in the Zone 3 Area All-State Junior High Music Festival. See more. Former Broome Dusters hockey player Max Hansen visited Chenango Valley High School on October 30. See more. New York State Senator Fred Akshar visited Mr. Tidick’s Current Events & Local History class on October 26. See more. More than 35 students from the Classes of 2019 and 2020 were inducted into the Chenango Valley High School chapter of the National Honor Society on October 25. See more. With so many post-secondary school options available, a local event helped more than 65 Chenango Valley High School students look further into these opportunities, all in one place. See more. Chenango Valley High School students showed Warrior Pride as the school held a Pep Rally on October 19! See photos. Students from a CV High School Fast Forward chemistry class had the opportunity to visit SUNY Broome during the grand opening of the Calice Advanced Manufacturing Center on October 16. On October 3, more than a dozen CV High School students learned about future job opportunities and received hands-on experience at the annual regional Construction and Technology Career Day event! The event was held at the Broome County Highway Facility in Chenango Bridge. See photos. Students from Chenango Valley High School received a lesson on the importance of safe driving practices on October 11. See more. Members of the Chenango Valley High School French Club took part in an "effrayant" (spooky) meeting on October 11. See more. Some of our awesome Chenango Valley High School families learned more about educational programs, procedures and opportunities at the school's Open House on September 17! See photos. 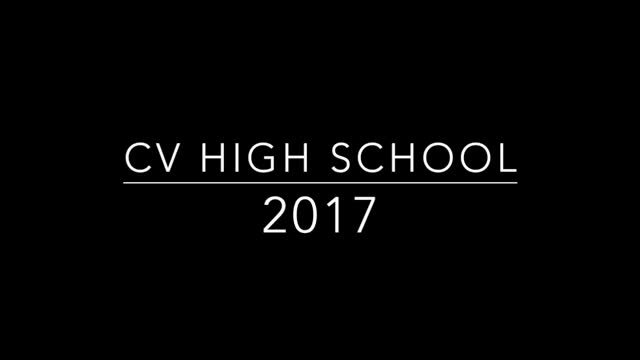 Thank you to Mr. Cass for sharing this amazing drone footage of CV! Attention Class of 2020 Parents: We are looking for your help for Post-Prom planning. SADD is looking to transition into parents putting on the Post-Prom Party next year.